I'm sure like many of you, I love all of Dana's (of Made) projects. When she provided the tutorial for the circle skirt I knew that it was one I wanted to try, and I must admit I am rather pleased with the results. I'd never dyed fabric before so the dying part was a bit of an adventure. I first dyed the elastic "purple" but it turned out an icy shade of lavender. I then dyed it dark brown...and I ended up with a nice neutral grayish brownish purple. I love the sheen on the fabric. The plaid is pretty fun too. The fabric is actually a home decor fabric, but I couldn't find anything desirable at Joann's. Does anyone else think that there is a serious lack of desirable apparel fabric available at Joann's? I ended up making my skirt 24" long. I'd hoped for 27", but 24 is all that I could squeeze out of my fabric. I does hit me below the knee, which I like for the fall/winter season. I think that I'm in need of a nice coordinating cardigan and some knee high socks. I feel like a little girl in my new twirly skirt. Have you tried the tutorial? Dana provides the best tutorials. 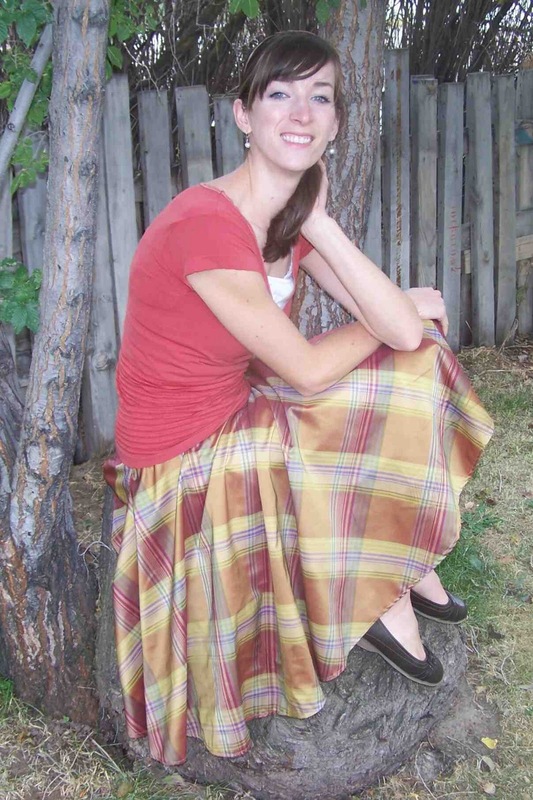 Be sure to stop by, show her some blog love, and make a twirly circle skirt for yourself. Your skirt is very pretty, Tricia. I like skirts that go below the knee because I have these annoying skinny legs. I would be comfortable in something like this. Thanks for sharing and for the link! I love this skirt beyond all that is reasonable. The plaid, the sheen, the twirly, the length -- love, love, love! Very nice. That's a great style for you! I totally agree about Jo-Ann's lack of selection when it comes to apparel fabric! But I love what you selected, it's beautiful on you. Happy Fabric Tuesday to you! Gorgeous! I love the fabric, and I really like the waistband color you ended up with. I've been meaning to try this tutorial... thanks for the inspiration! Beautiful skirt! Going to check out that Tute! no i have NOT tried that tutorial but now i really want to!! for my daughter of course. ... i never sew for my own body (too depressing to buy that much fabric or take the measurements, haha). Super cute! The skirt turned out just beautiful - the fabric is great! Super cute! fun skirt! THanks for linking up to quiltstory! Nicely done. This really makes me want to try to make one for me! I keep making stuff for my little one but where's my love??? I like the plaid, too. Thanks for the inspiration. I love the skirt, the fit is perfect! Your skirt is very pretty! Thank you for linking to my party! Your skirt looks amazing! I just used that same tutorial to make a dress with a circle skirt! Check it out! And...I think it's hard to find decent apparel fabric anywhere! I know there are many places online but I like to feel it/see it before I buy it. Your skirt came out beautiful. I agree about JoAnns! When will they get some new buyers who are hip to the current trends with sewers. Geez, it's not that hard to have a look at the popular blogs and see what we are looking for..I wonder if they are making so much money they just don't care? 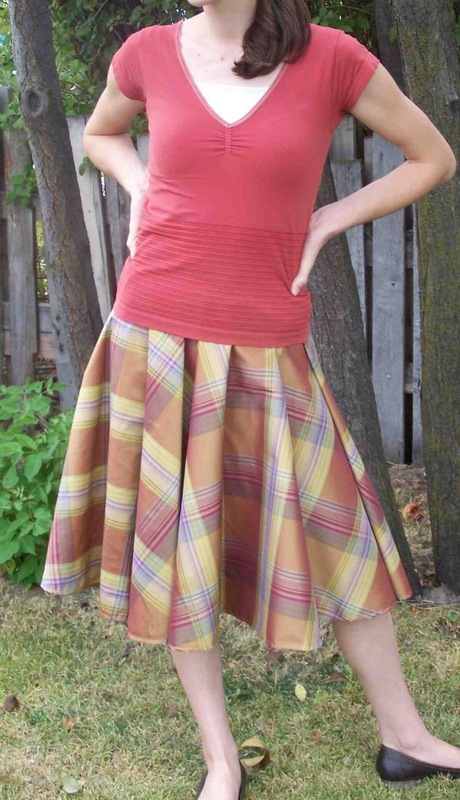 I have seen this tutorial from MADE before, but your skirt makes me want to try it even more. It is great. Thanks for sharing!